Are you there? Send pictures, but please stay safe. Beirut, Lebanon (CNN) -- A pair of suicide bombs detonated outside the Iranian Embassy in Lebanon's capital Tuesday, killing nearly two dozen people in a bloody new ripple from neighboring Syria's civil war. 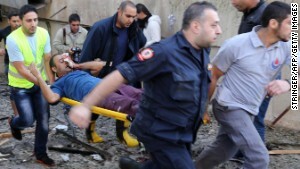 Lebanon's Health Ministry said at least 23 people were killed and 147 wounded. Among the dead was Iran's cultural attache, Ebrahim Ansari, Iran's state-run news agency reported. The victims also included two Iranian civilians who lived in a building close to the embassy, Lebanon's National News Agency reported. The Abdullah Azzam Brigades, a Sunni jihadist group linked to al Qaeda, claimed responsibility for the bombings via Twitter. The group warned that more attacks would come unless the Lebanese-based, Iranian-backed Shiite militia Hezbollah stops sending fighters to support Syrian government forces. It also demanded the release of the group's members being held prisoner in Lebanon. The Lebanese army said one of the blasts was caused by a suicide bomber on a scooter, and the other was caused by a suicide bomber in an SUV. Stunned witnesses looked on as massive flames and pillars of black smoke leaped into the sky over Beirut, while fires burned out several cars parked on a nearby street. Are Beirut bombings connected to Syria? At least six buildings were damaged, Lebanese Internal Security Forces said. Lebanon's acting prime minister, Najib Mikati, said the blasts were "a cowardly terrorist attack" and urged the Lebanese public "to exercise the utmost restraint because we are going through a very difficult phase," according to NNA, the Lebanon news agency. Mikati also called the Iranian ambassador to check on his safety and express his condolences, NNA said. The Iranian ambassador to Lebanon, Ghazanfar Roknabadi, told Hezbollah's Al-Manar TV that he had no doubt the embassy was the target of the two blasts, but that any effort to thwart Iran's agendas would be unsuccessful. "We have no fear when it comes to giving more martyrs in the line of duties," he said. Tuesday's attack is the latest in a series of bombings, rocket attacks and killings that have spilled over from Syria's three-year civil war, which also has left Lebanon straining under the weight of more than 818,000 refugees, according to the United Nations. 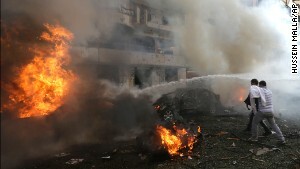 In August, a pair of bombs ripped through neighborhoods near mosques in Tripoli, Lebanon, with ties to Syrian rebels. At least 27 people died in that attack, while a car bomb targeting a Hezbollah stronghold in a southern suburb of Beirut killed at least 22 and injured hundreds. More than 100,000 people have been killed in Syria, where the Iranian-backed government of President Bashar al-Assad is battling rebels seeking an end to his family dynasty. Al-Assad and the core of his regime are Alawites, members of an offshoot of Shia Islam, but the majority of Syrians and a large portion of the rebels are Sunni. Beirut-based Middle East analyst Rami Khouri told CNN that Sunni jihadist groups have grown rapidly in the past decade and now threaten "everybody in the region." "They're anti-Iran, anti-Arab, anti-Israeli, anti-Turkish," said Khouri, director of the Issam Fares Institute of Public Policy and International Affairs at the American University of Beirut. "They are the big threat, and the fact that these guys are now getting into the business of bombing embassies and bombing their adversaries with suicide bombs is really something quite frightening to everybody." The Abdullah Azzam Brigades has claimed responsibility for a failed attack on U.S. warships docked in Jordan and for bombings of Egyptian beach resorts in 2004 and 2005 that killed more than 100 people. The United States declared it a terrorist group in 2012, saying it was responsible for a 2010 attack on a Japanese-owned oil tanker in the Strait of Hormuz and had expressed interest in attacking Western interests in the Middle East. The group formed in the Palestinian refugee camps in Lebanon and has battled Lebanese government troops before, Khouri said. Khouri said the violence is part of a longstanding struggle for influence among Shiite-led Iran, Sunni-led Saudi Arabia and their allies that has turned much of the region "into a single political and military battleground." "Syria aggravated this and made it much more brutal, much more barbaric and spilling over with refugees, arms flows, artillery fire across borders in the region," he said. But he added, "If Syria were to settle down tomorrow, you would probably still have some of these groups fighting each other in Iraq or in Lebanon or in other places in the region." CNN's Nick Paton Walsh reported from Beirut; Matt Smith wrote from Atlanta. CNN's Hamdi Alkhshali, Saad Abedine. Nada Husseini and Holly Yan contributed to this report.